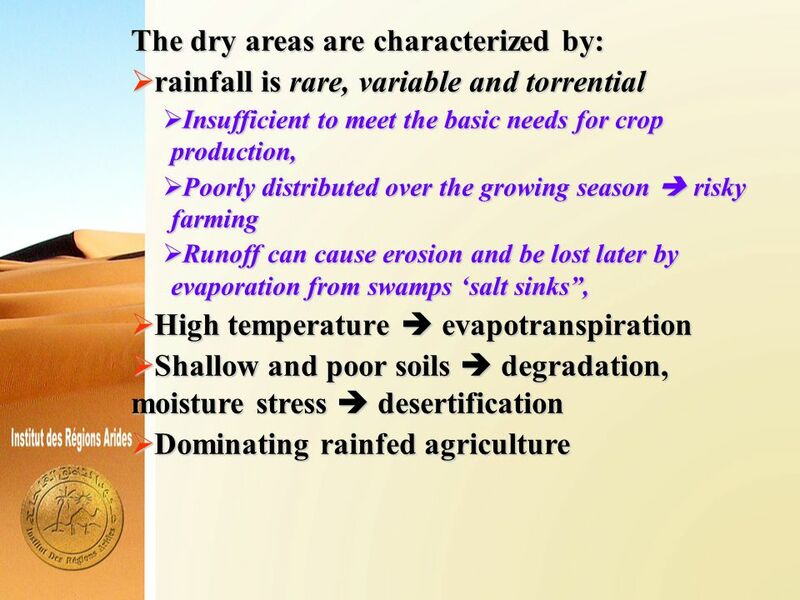 10  As long as the people have inhabited the dry areas and made cultivation, they have harvested water. 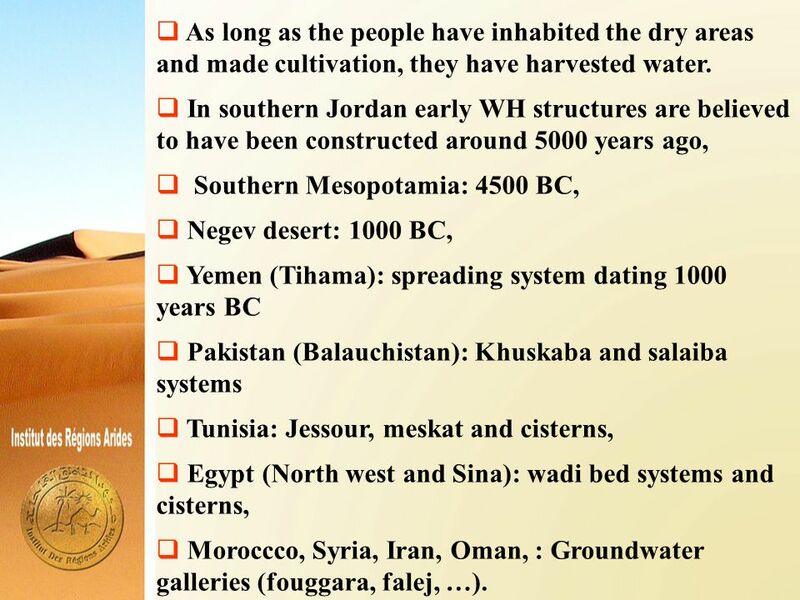  In southern Jordan early WH structures are believed to have been constructed around 5000 years ago,  Southern Mesopotamia: 4500 BC,  Negev desert: 1000 BC,  Yemen (Tihama): spreading system dating 1000 years BC  Pakistan (Balauchistan): Khuskaba and salaiba systems  Tunisia: Jessour, meskat and cisterns,  Egypt (North west and Sina): wadi bed systems and cisterns,  Moroccco, Syria, Iran, Oman, : Groundwater galleries (fouggara, falej, …). 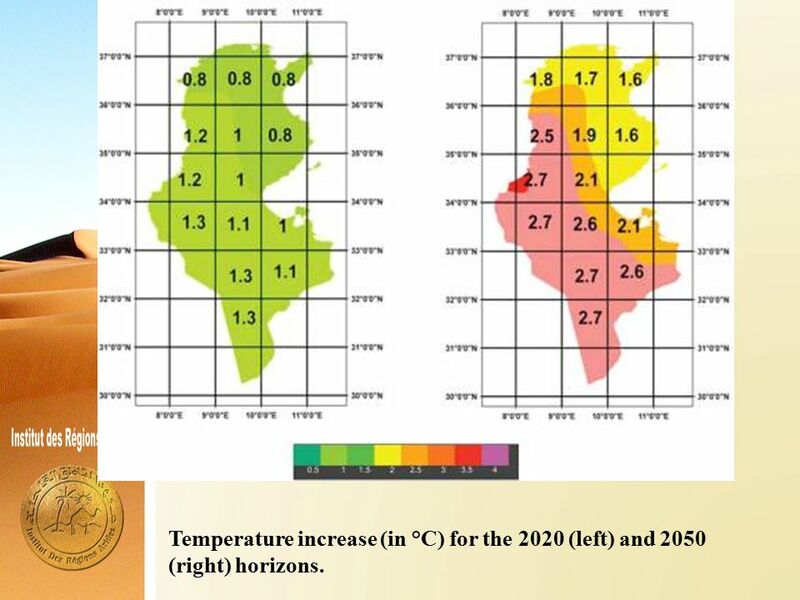 16 Temperature increase (in °C) for the 2020 (left) and 2050 (right) horizons. 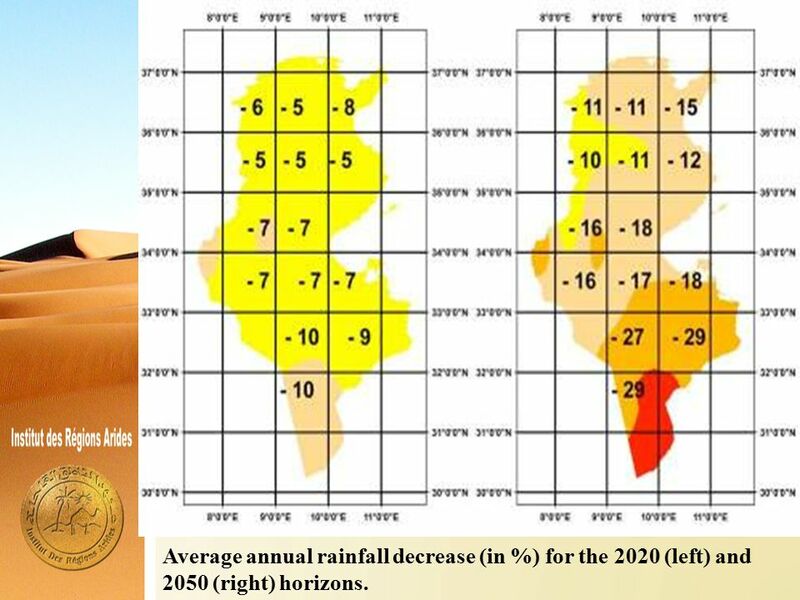 17 Average annual rainfall decrease (in %) for the 2020 (left) and 2050 (right) horizons. 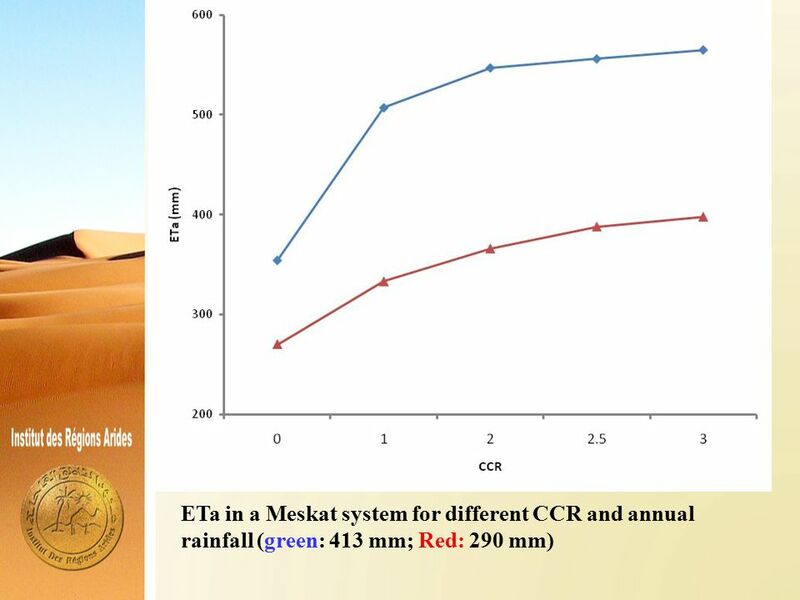 31  Water harvesting techniques have been developed since antiquity to cope with climate variability in the dry areas. 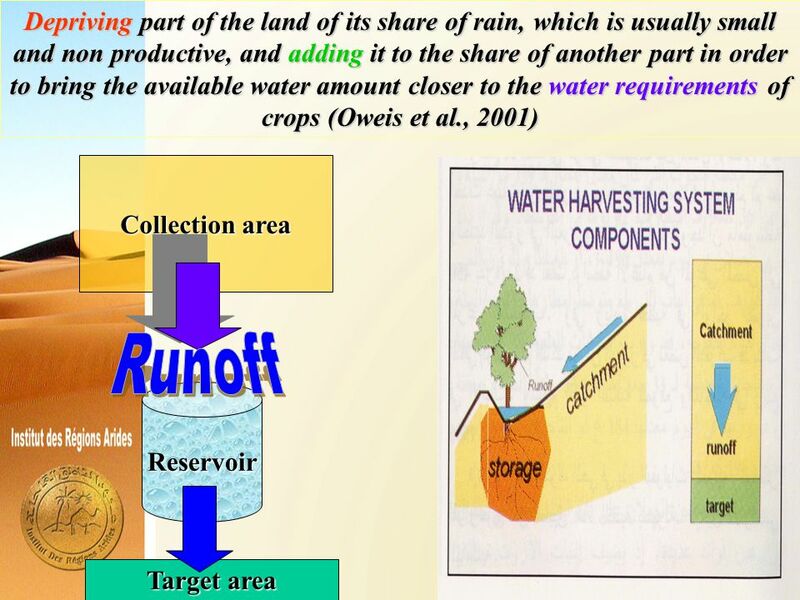  They played major role in the development of rainfed agriculture in addition of providing other ecosystem services  With the prospect of CC, those systems/techniques would be more useful. 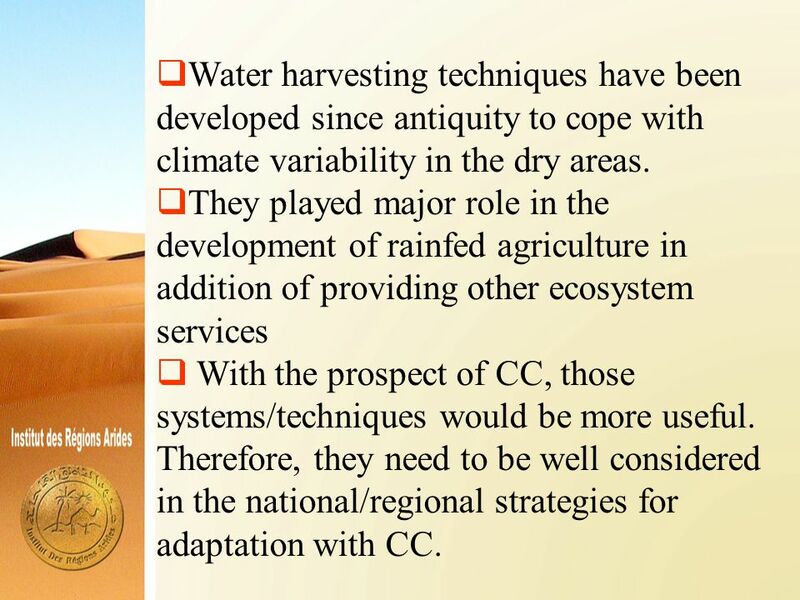 Therefore, they need to be well considered in the national/regional strategies for adaptation with CC. 32 32 Alaya, K., Viertmann, W., Waibel, Th. 1993. 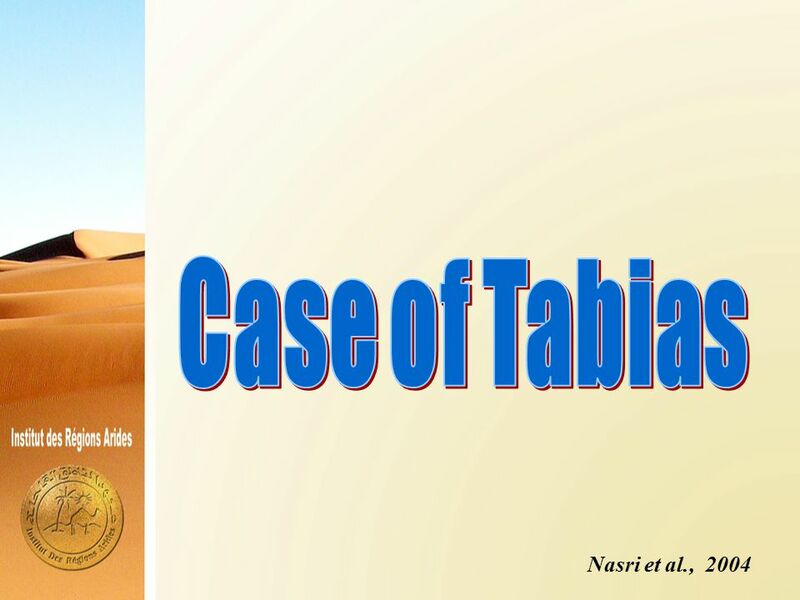 Les tabias. Imprimerie Arabe de Tunisie, Tunis, Tunisia. 192 pp. Carton, D. 1888. Essai sur les travaux hydrauliques des Romains dans le Sud de la Régence de Tunis. Bulletin Archéologique du Comité des Travaux Historiques et Scientifiques, 438-465. Chahbani, B. 1990. 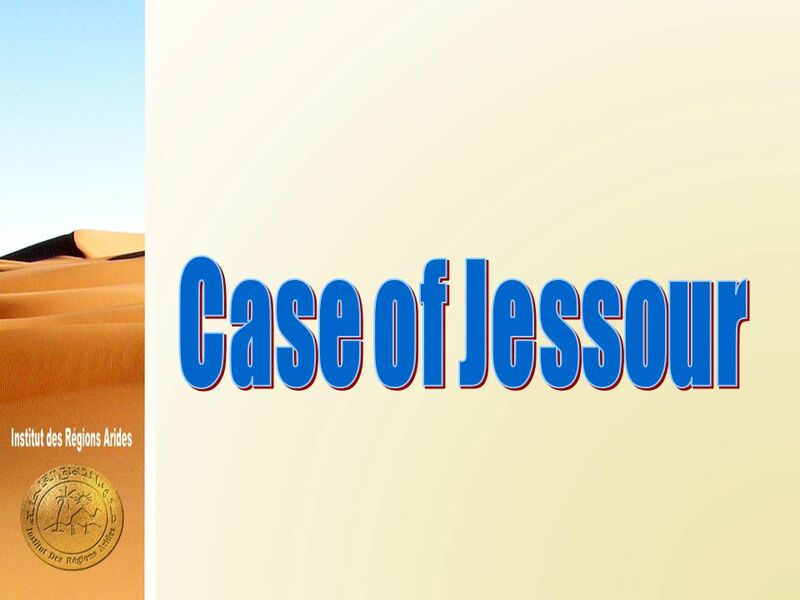 Contribution à l’étude de la destruction des jessour dans le sud tunisien. Revue des Régions Arides, 1: 137-172. De Graaff, J., Ouessar, M. 2002 (eds). 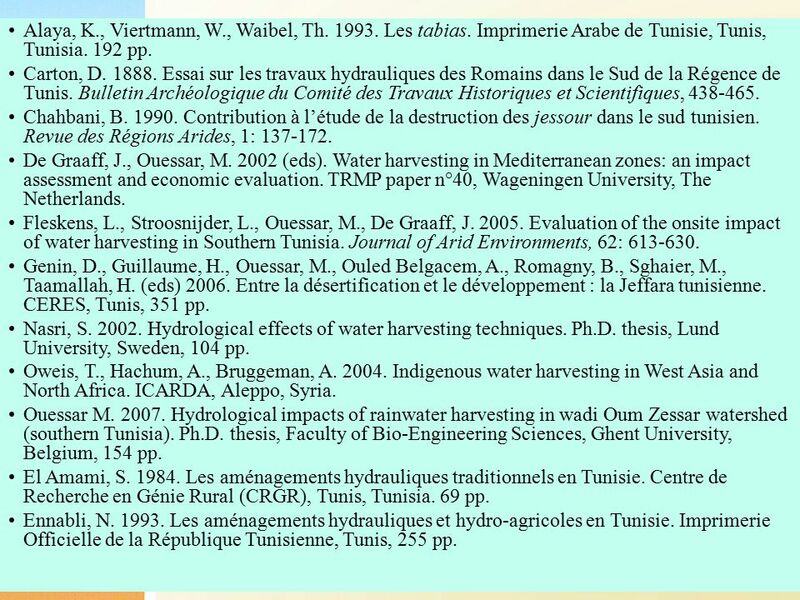 Water harvesting in Mediterranean zones: an impact assessment and economic evaluation. 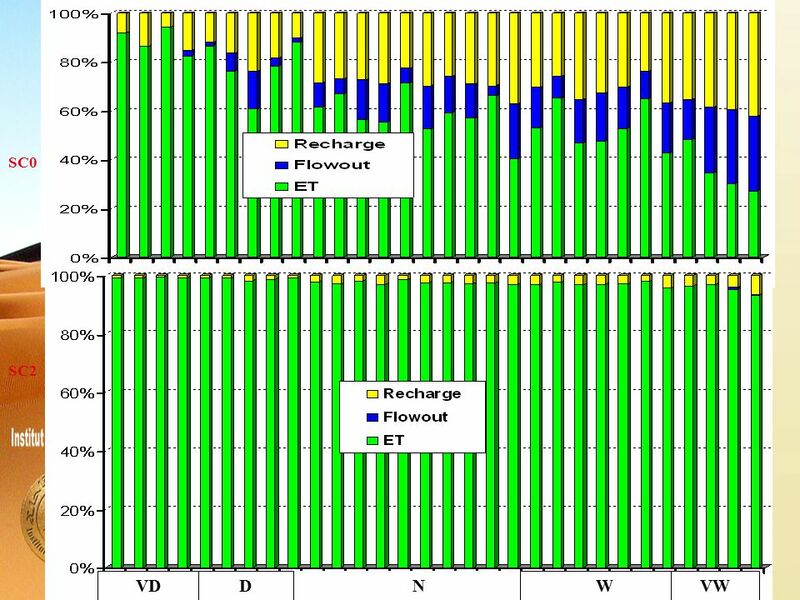 TRMP paper n°40, Wageningen University, The Netherlands. Fleskens, L., Stroosnijder, L., Ouessar, M., De Graaff, J. 2005. 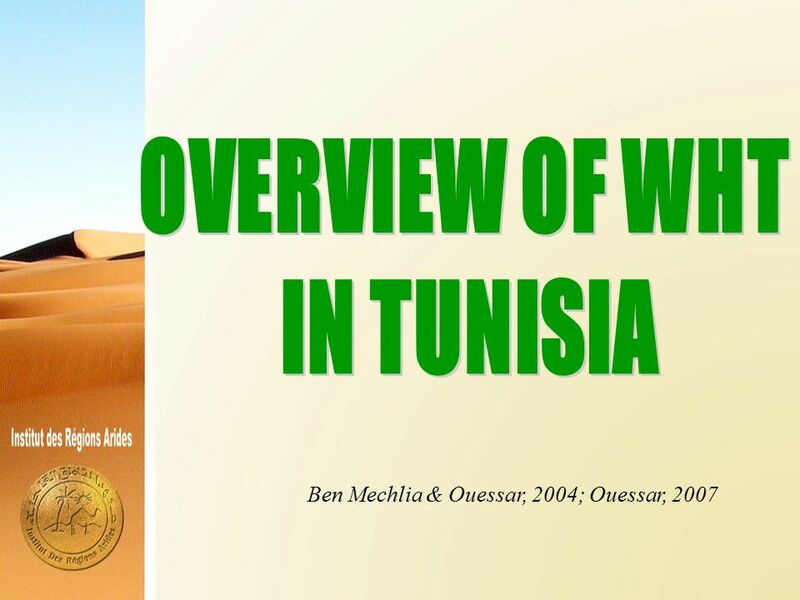 Evaluation of the onsite impact of water harvesting in Southern Tunisia. 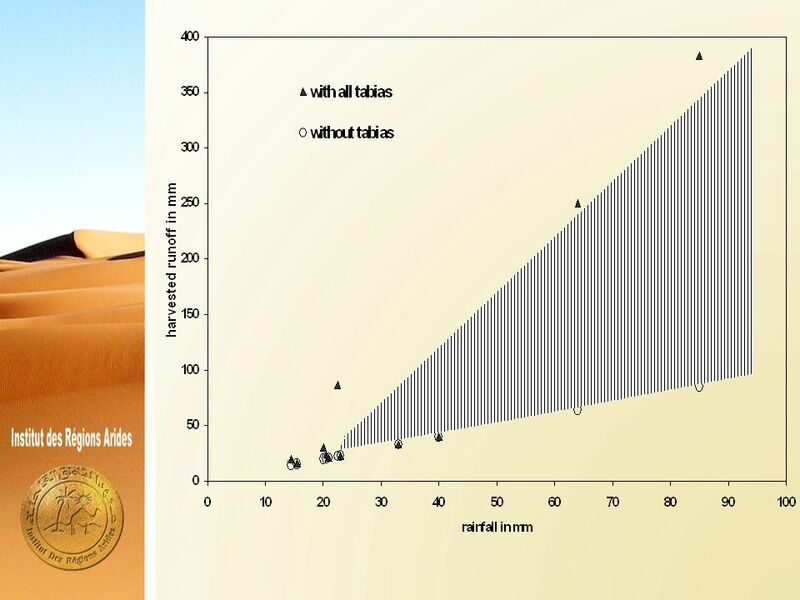 Journal of Arid Environments, 62: 613-630. 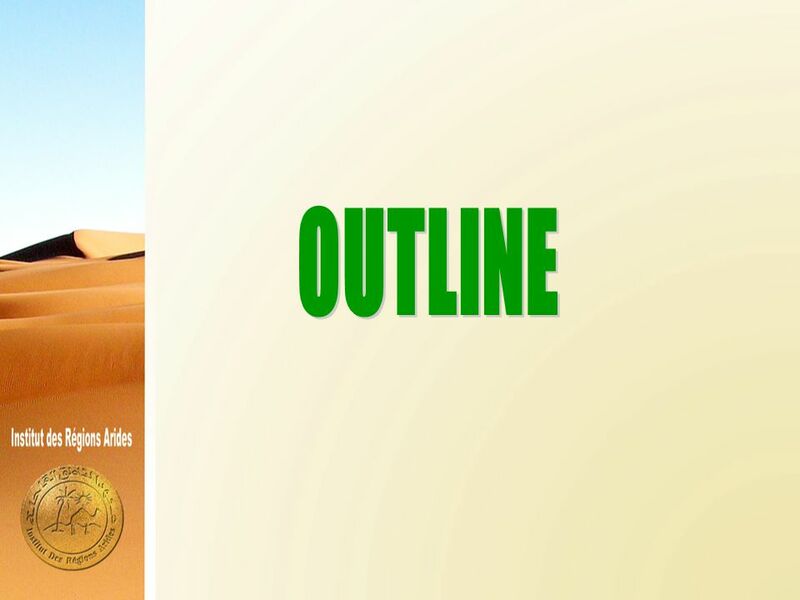 Genin, D., Guillaume, H., Ouessar, M., Ouled Belgacem, A., Romagny, B., Sghaier, M., Taamallah, H. (eds) 2006. 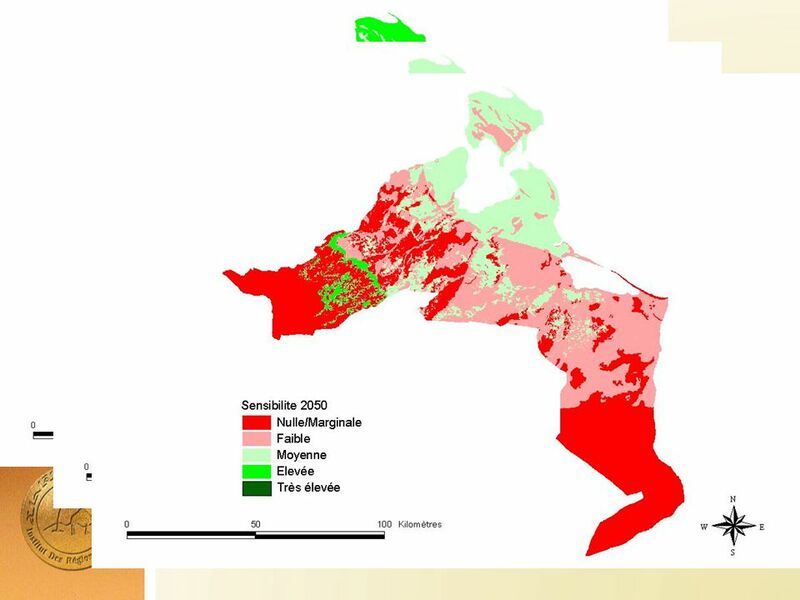 Entre la désertification et le développement : la Jeffara tunisienne. CERES, Tunis, 351 pp. Nasri, S. 2002. 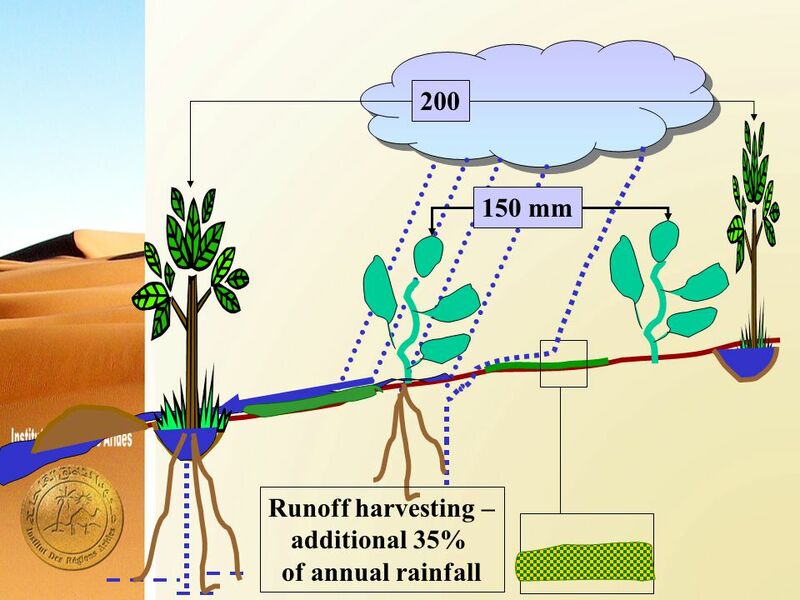 Hydrological effects of water harvesting techniques. 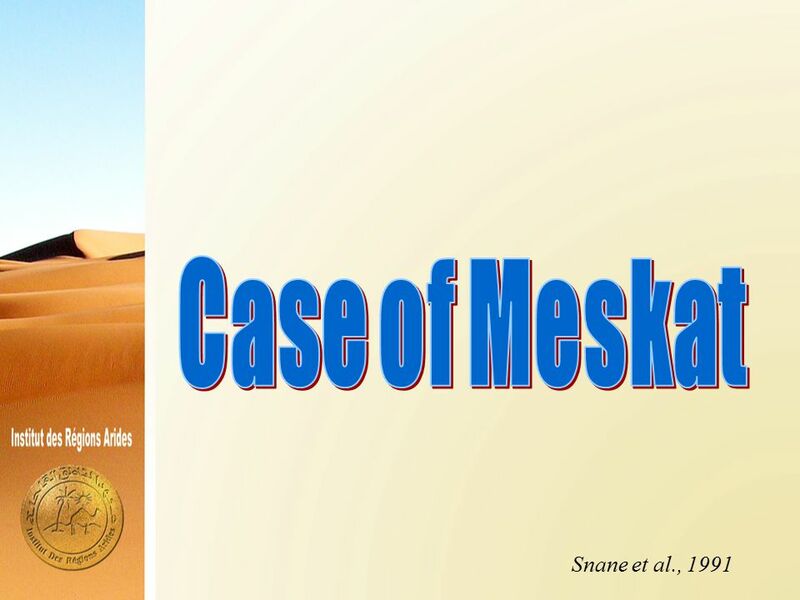 Ph.D. thesis, Lund University, Sweden, 104 pp. Oweis, T., Hachum, A., Bruggeman, A. 2004. 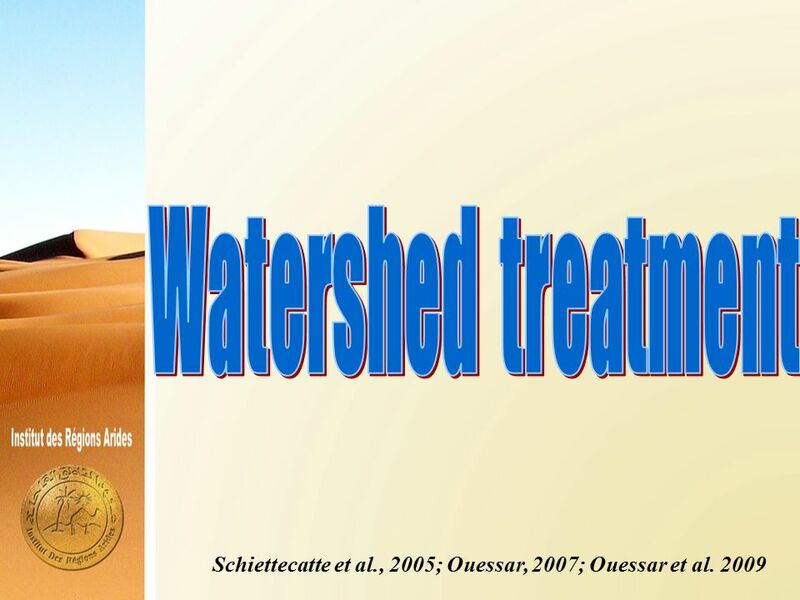 Indigenous water harvesting in West Asia and North Africa. ICARDA, Aleppo, Syria. Ouessar M. 2007. 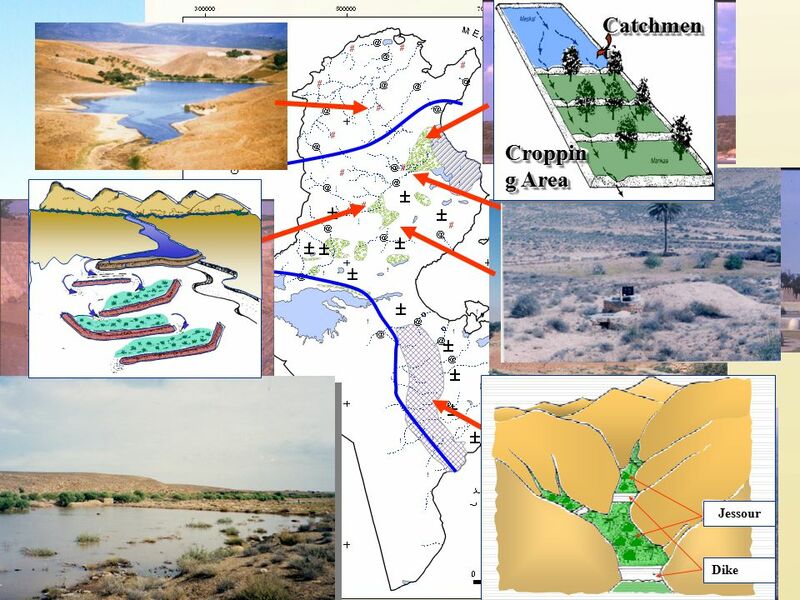 Hydrological impacts of rainwater harvesting in wadi Oum Zessar watershed (southern Tunisia). 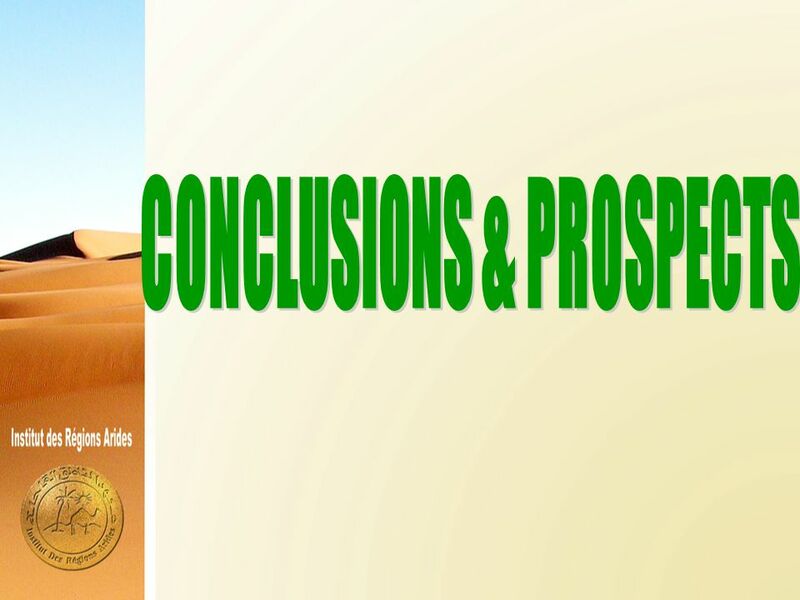 Ph.D. thesis, Faculty of Bio-Engineering Sciences, Ghent University, Belgium, 154 pp. El Amami, S. 1984. 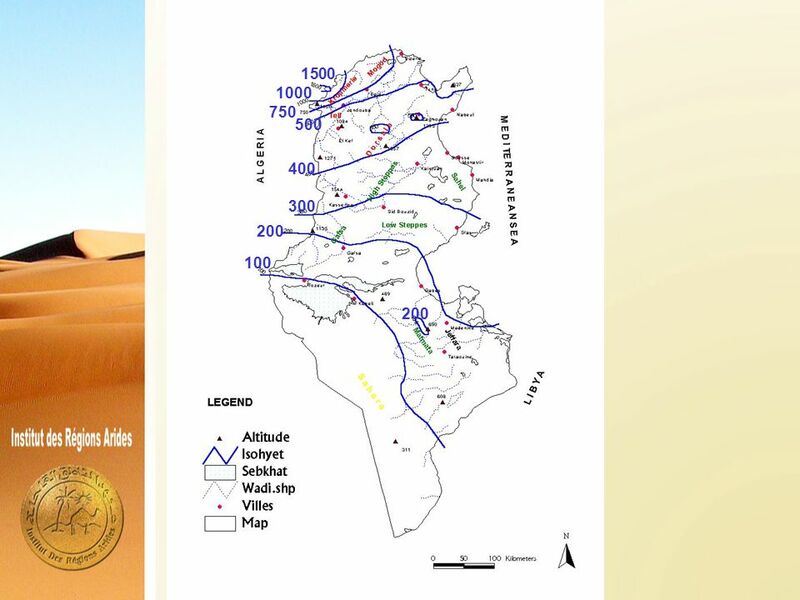 Les aménagements hydrauliques traditionnels en Tunisie. Centre de Recherche en Génie Rural (CRGR), Tunis, Tunisia. 69 pp. Ennabli, N. 1993. 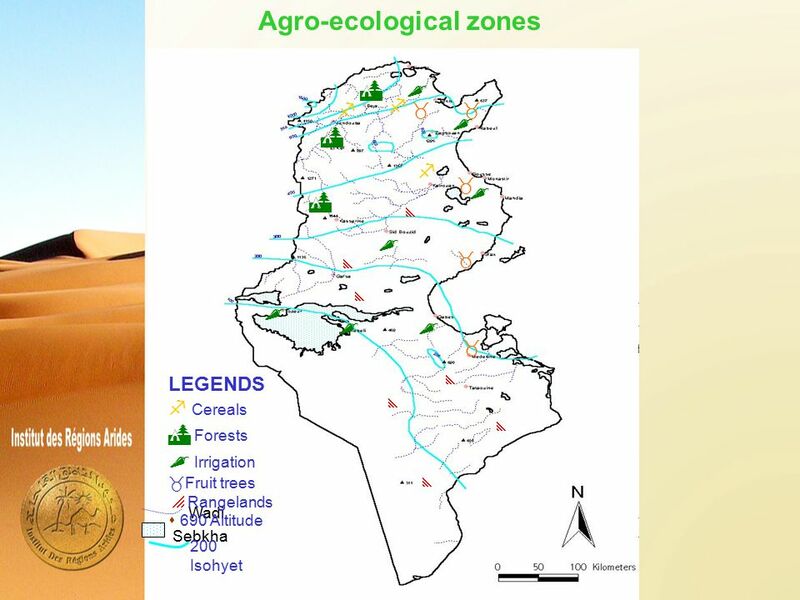 Les aménagements hydrauliques et hydro-agricoles en Tunisie. Imprimerie Officielle de la République Tunisienne, Tunis, 255 pp. 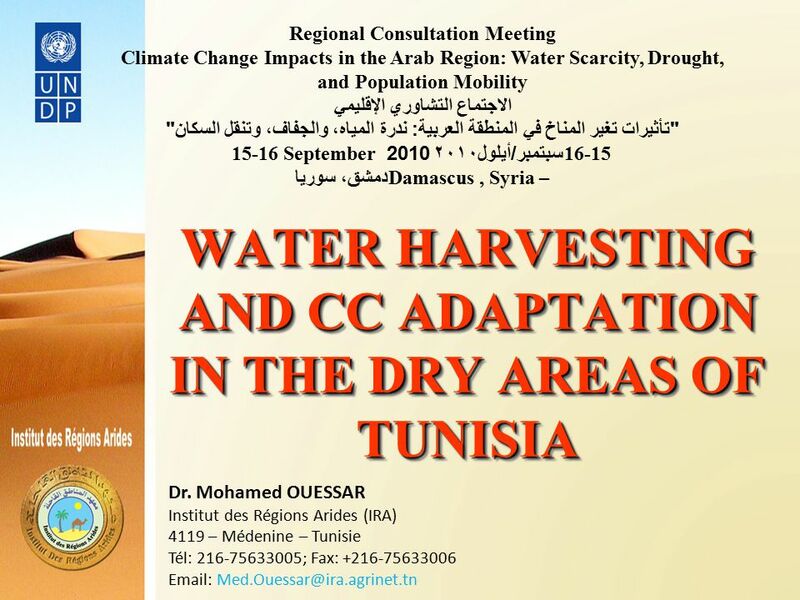 Download ppt "WATER HARVESTING AND CC ADAPTATION IN THE DRY AREAS OF TUNISIA Regional Consultation Meeting Climate Change Impacts in the Arab Region: Water Scarcity,"
Water and Climate Change in Africa Raffaello Cervigni The World Bank. Programme priorities for Near East and North Africa Mona Bishay Director of Near East and North Africa Division, PMD April th Replenishment. 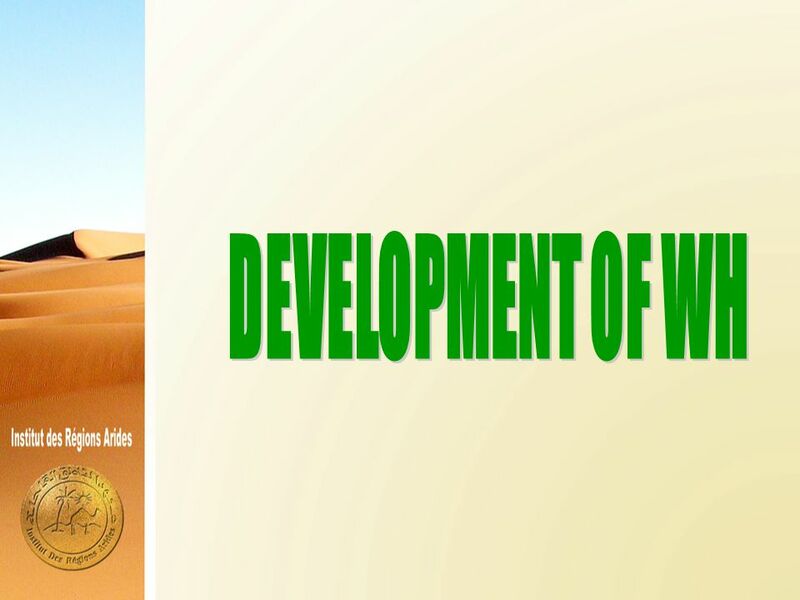 In Magta Lahjar, Mauritania Sustainable Management of water surfaces, submitted to Kyoto Grand Prize contribution to the fight against poverty submitted. EFICENT launching event 3rd of April 2009 Friburg, Germany EFI Mediterranean Regional Office –EFIMED In brief Marc Palahi Head of EFIMED. 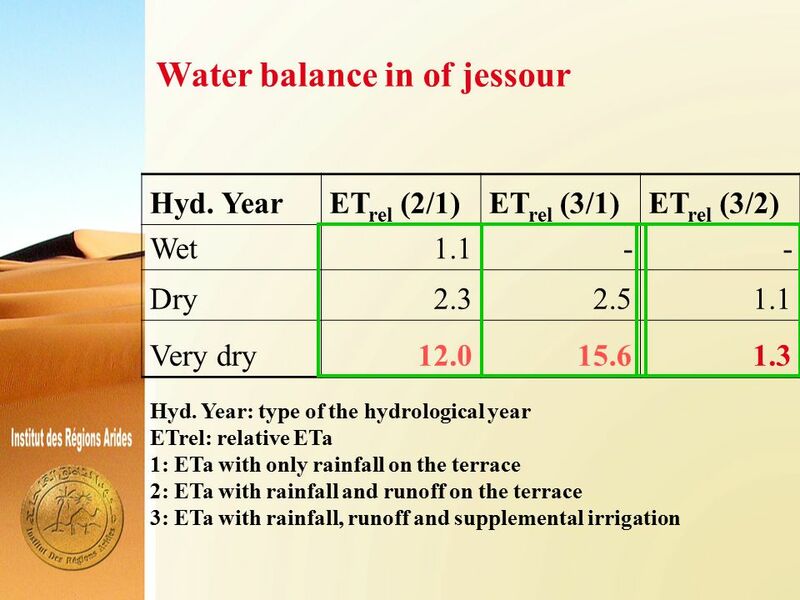 Near East and North Africa Managing water scarcity. 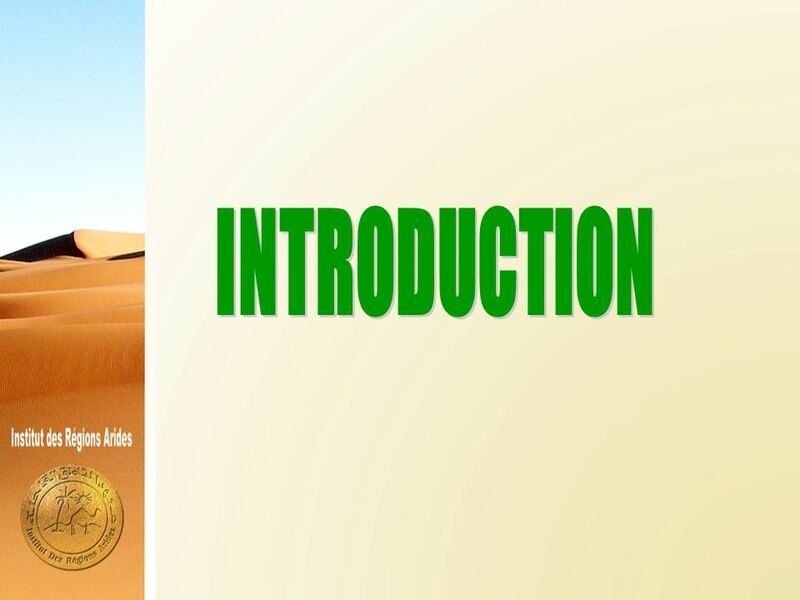 Twenty Questions Science Review Chapter 1: Lessons 1 & 2. 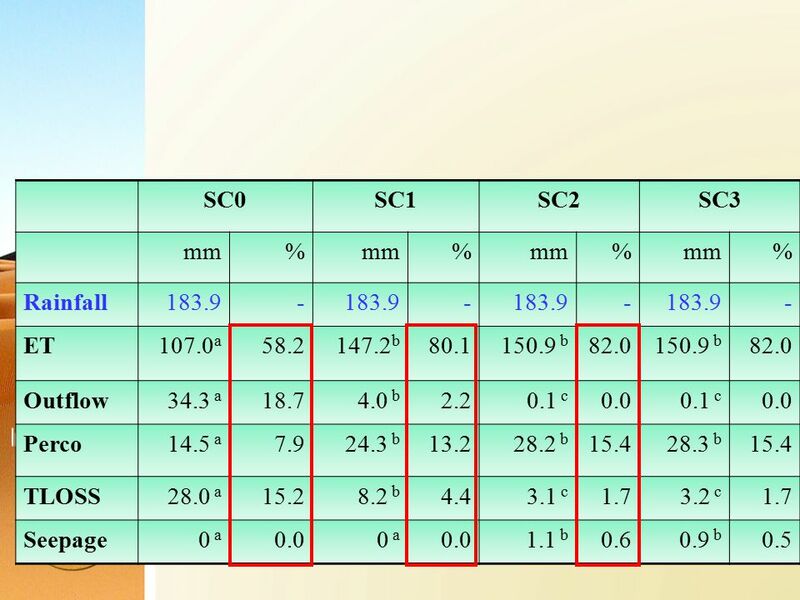 Performance of Bubbler Irrigation System as Compared to Drip for Large Size Date Palm Tree Farm Ahmed I. Al-Amoud. 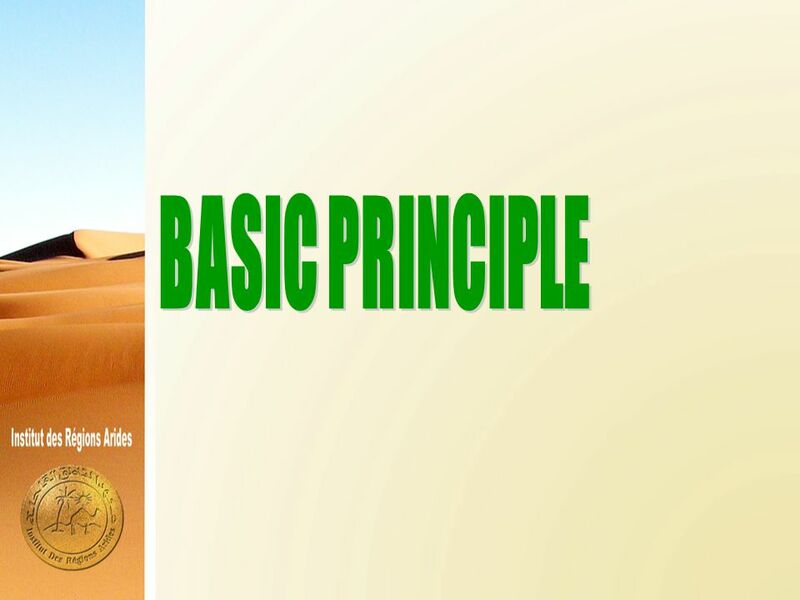 THEMATIC SLIDES. CROPLAND Almeria, Spain Santa Cruz, Bolivia Novovolyns’k, Ukraine Torreon, Mexico Tensas River Basin, United States Shatt al-Arab, Iraq/Iran. 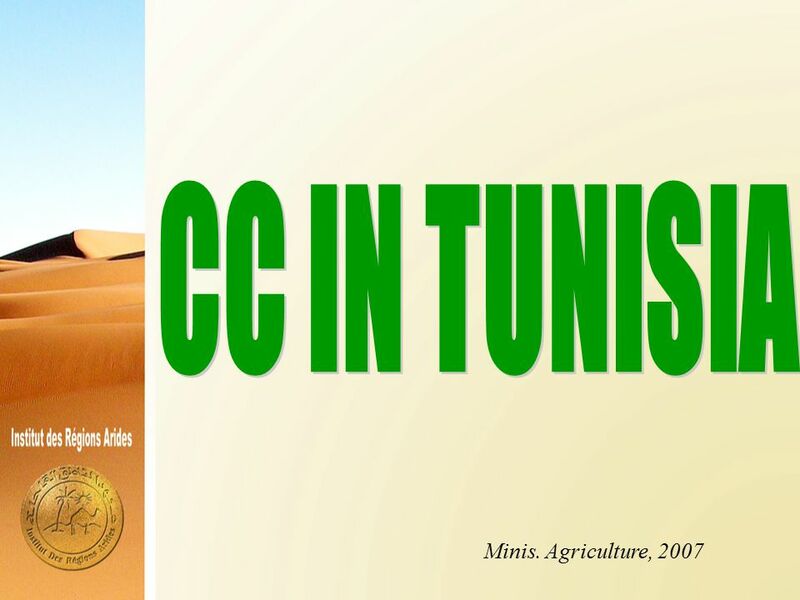 E-AGRI Kick-off meeting, March 2011, VITO (Mol, Belgium) RS based crop forecasting in Morocco Riad BALAGHI National Institute for Agricultural Research. 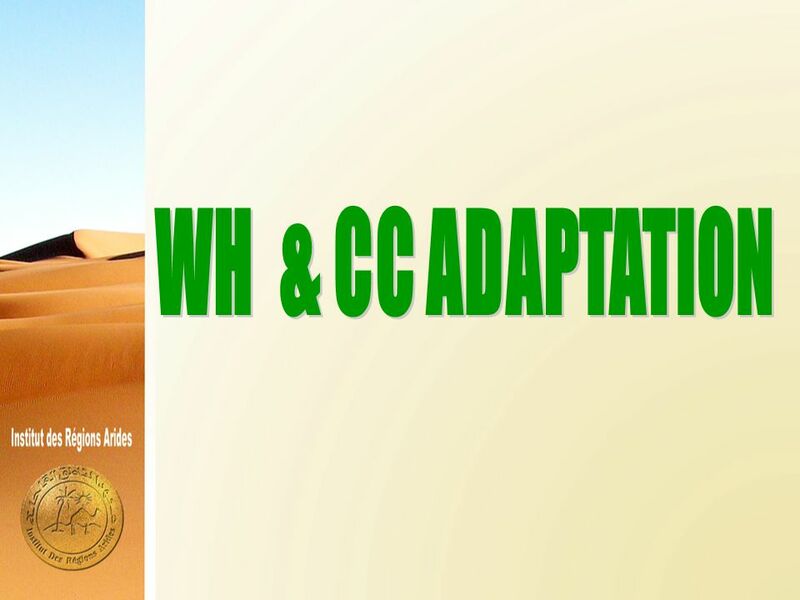 SECRETARIAT OF THE CONVENTION TO COMBAT DESERTIFICATION SECRETARIAT DE LA CONVENTION SUR LA LUTTE CONTRE LA DESERTIFICATION 1. Jurandir ZULLO Junior Effective use of agrometeorological systems and information Expert Meeting on Weather, Climate and Farmers. Climate Change Vulnerability in Jakarta Dr. Armi Susandi, MT. Bandung Institute of Technology National Council on Climate Change Republic of Indonesia. 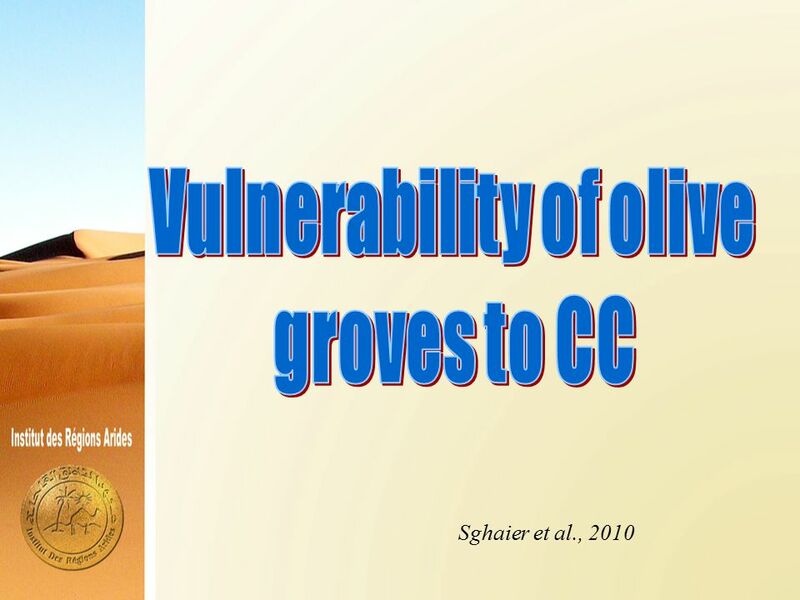 Agroecology: at the crossroad for adaptation to climate impacts, desertification reduction and biodiversity conservation.